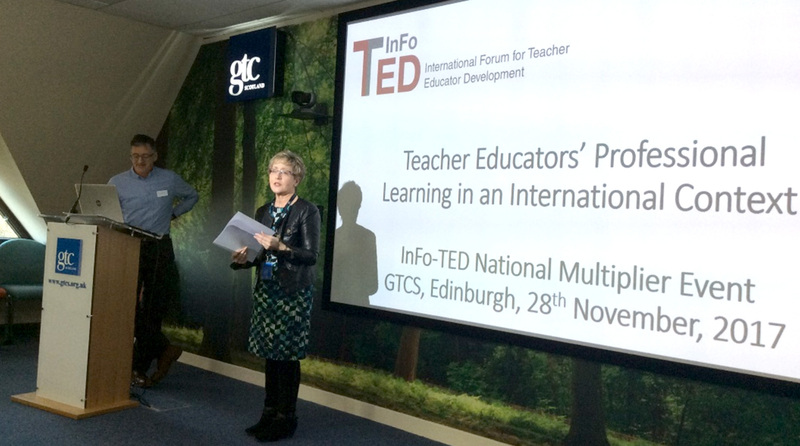 The InFo-TED UK and Ireland Regional Seminar was held in Scotland’s capital city, Edinburgh, with attendees from across Scotland, England, Ireland, Northern Ireland, and Wales. The General Teaching Council for Scotland (GTCS) premises at Clerwood House offered a wonderful venue with a warm welcome given to all by Ellen Doherty, Director of Education, Registration and Professional Learning for the GTCS (see photo). This created the stimulus for rich discussion with the invited attendees offering insights on the professional learning of teacher educators and teacher education from their different contexts and perspectives, and the opportunity to explore connections with InFo-TED and other networks, ensuring an engaging day for all.